« Does No Controller Mean More Control? Lightworks, once the darling of longform post production, may soon find a second life. 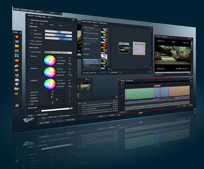 EditShare plans to release the first beta from their ongoing open source project on November 29. If you’ve registered, you’ll be able to download it for free. At the moment, it’s Windows-only, but they plan a Mac port next year. The list of features is impressive, at least on paper: resolution independence up to 2K, multiple frame-rate support, native support for DNX, Prores, R3D and dpx files, 3D support, unlimited multi-cam, subframe audio editing, audio bus routing, project sharing, film footage display in the application, 3-perf support, change lists, a node-based vfx interface with support for many common vfx plug-ins, secondary color correction — all wrapped in a modular user interface that looks slick. Check out the full feature list here, and the company website here. Competition among editing system manufacturers drives development and keeps everybody on their toes. Lightworks fell out of favor because of a quirky interface and weak visual effects capabilities, but it has remained a favorite for some editors, Thelma Schoonmaker and Chris Gill among them. I’ll be very curious to see how the new build performs in the real world. This entry was posted on November 9, 2010 at 12:57 pm and is filed under Laptop Editing, Lightworks. You can subscribe via RSS 2.0 feed to this post's comments. You can comment below, or link to this permanent URL from your own site.